I can't believe it's so easy to make and the ingredients can be easily found in the kitchen. 1. Marinate the ribs with salt and pepper and set aside for 15-30 minutes. 2. Prepare the all-purpose flour and cornstarch. Mix. The proportion should be 1:2 for cornstarch and all purpose flour. 3. 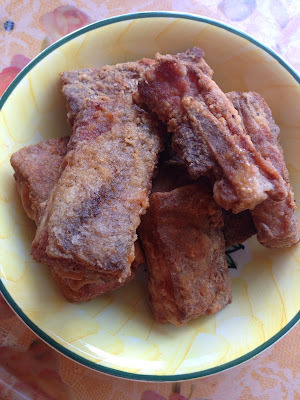 Coat the marinated pork ribs with the flour and cornstarch mixture. 4. Heat the oil on a frying pan on medium heat. 5. Fry the ribs until well done. To make it crispy, increase the heat to high-heat when it's almost cooked.